CRYSTAL—Cirque du Soleil’s 42nd production and first-ever experience on ice—has arrived in San Jose’s SAP Center until April 1, 2018. 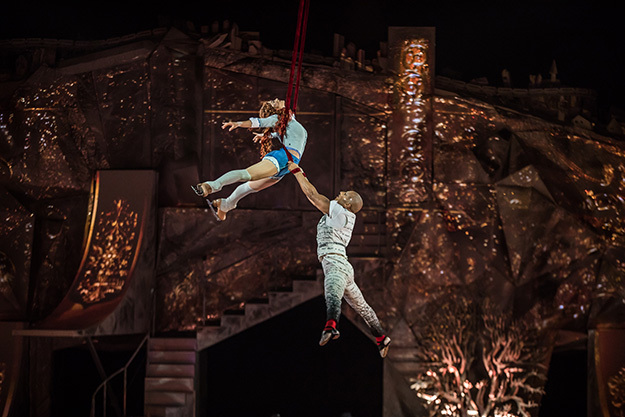 In typical Cirque fashion, the show is innovative, visually stunning, funny, and full of imaginative scenarios that only a Cirque show can take you through. 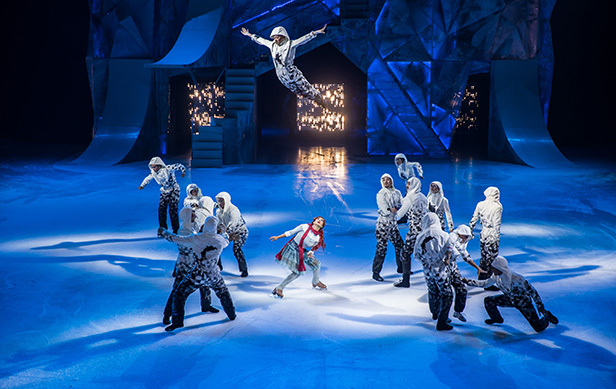 Artists and skaters perform acrobatics on the ice and in the air, seamlessly combining multiple disciplines to take the audience into the dream world conjured up by the show’s main character, Crystal (Nobahar Dadui). Crystal finds herself feeling the weight of the mundane life and dreaming of breaking away, “I don’t belong here, I want to live in a book…”. 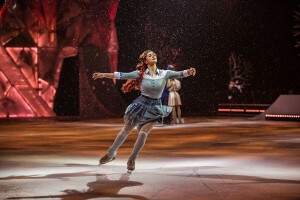 She tells herself, “skate away from them all, find the one inside”, and then begins a magical world of synchronized skating, freestyle, figure, and extreme skating combined with swinging trapeze, aerial straps and hand to hand acts. She goes through a self-reflection that leads her to a feeling of freedom and empowerment. The acrobats push their limits and fly through the air demonstrating a weightlessness one can only feel when open to taking risks. Another key feature of Cirque shows is their dedication to warming up the audience. Prior to show time they take a more creative approach to getting your attention than just blinking the house lights on and off. For Crystal, this warm up included snow ball fights on stage and within the audience. This is what makes Cirque enjoyable by many. Their creative approach caters to their specific audience, in this production it’s inclusive to all ages and tastes. Want to get your first choice at seats at future shows? Sign Up for a complimentary membership. Cirque Club members receive advance access to the best seats, deals and discounts for tickets, promotions with their partners and a chance to experience never before seen exclusive Cirque du Soleil content. Update: Cirque has done it again, all shows at the San Jose location are sold out.